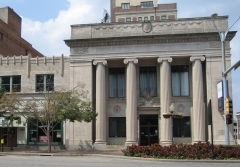 Architect: Carroll, J. Maurice; Williamson, Loebsack & Assoc. The Church of the Assumption (1924) and Assumption Rectory (1929) were listed in the National Register of Historic Places in 2008. The buildings, along with an associated garage, were nominated for their architectural significance as examples of the Mission Revival and Renaissance Revival styles. This nomination expands the boundaries to include the two associated schools, the former Hayden High School (1939) and Assumption School (1954), and adds an argument for the property's educational significance. The Church of the Assumption established the first Catholic elementary school and high school in Topeka. For much of the period of significance, Hayden High School served all of the city's Catholic parishes. The construction of Assumption School in 1954 during the Baby Boom illustrates the rapid expansion of growth of Catholic education after World War II. The Church of the Assumption, completed 1924, and Assumption Rectory, completed 1929, are nominated for their architectural significance as examples of the Mission Revival and Renaissance Revival styles. Character-defining features include blond brick, stucco, clay-tile roofs, arched openings, wide overhanging eaves, contrasting materials, towers and domes. 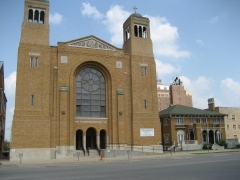 The church was constructed as the third church for Topeka's Assumption Parish, which was the city's first Catholic parish. The rectory has a garage that was constructed in 1954 from plans by Topeka architect Thomas Williamson. Until 1914, Topeka Catholics were served by two parishes - St. Joseph's and Assumption. By the early 20th century, Topeka's westward-moving population necessitated the creation of a new parish to accommodate the 250 Catholic families who lived west of Topeka Boulevard and south of the Kansas River. The fledgling new Holy Name parish purchased property at the corner of Tenth and Clay streets on which to build its first building - a combination church, school, rectory, and office building. 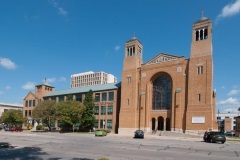 Under the leadership of Father Michael O'Leary, the parish made plans for a permanent house of worship, and hired Chicago architect Henry Schlacks to design the building. Schlacks combined his interest in architecture and devotion to the Catholic Church when in 1898 he founded the Notre Dame architecture program, the first at any Catholic university in America. Modeled after Chicago's St. Ignatius Church, which Schlacks designed, Topeka's Church of the Holy Name was completed in 1925 and reflects the Renaissance Revival style. 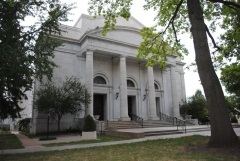 The two-story building features a cross plan, a dressed Carthage limestone exterior with Tuscan Doric pilasters at all corners and junctions, and a tile roof. The building is nominated for its architecture. 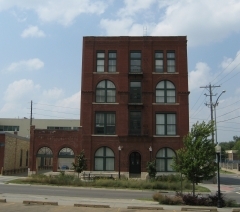 The district is locally significant for its association with the development of the College Hill residential and commercial neighborhood that developed in conjunction with Washburn College (later Washburn University) in the late nineteenth and early twentieth centuries. The period of significance extends from circa 1888, the date of construction of the oldest historic residence, to circa 1930, the date of construction of the last contributing building. 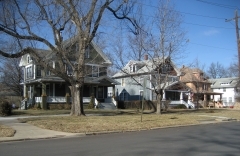 The College Hill neighborhood had a unique identity due to its associations with the college; the establishment of its own shopping area, school, and churches; and its distinct built environment. The district is also locally significant for its residential architecture, which reflects a continuum of middle- and upper-middle-class single-family residential architectural styles popular during the late nineteenth century and the early decades of the twentieth century. 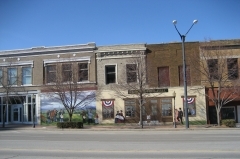 Topeka's Constitution Hall is located at 427-429 S. Kansas Avenue and was built in 1855. Although it features a front façade added in the early twentieth century, this two-story Territorial period building is largely constructed of native limestone and features a vernacular method of construction prevalent during this period. It is historically significant for its association with events in the Kansas Territory, from 1854 when this land was opened for U.S. settlement, to 1861 at Kansas's statehood and the beginning of the Civil War. It was nominated for its association with the 1850s Free State constitutional movement in Kansas. Journalist and editor Nelson Antrim Crawford lived at 2202 SW 17th Street from 1938 until his death in 1963. Crawford wrote the first college textbook on journalism ethics in 1924, managed the popular monthly magazine Household Magazine for over 20 years, and co-authored books with friend and fellow Topekan, Dr. Karl Menninger. 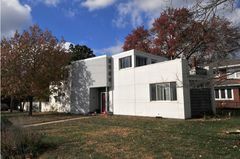 Crawford’s International style house was designed by Kansas architect Floyd Orson Wolfenbarger, and it was the first of its kind in the city of Topeka. 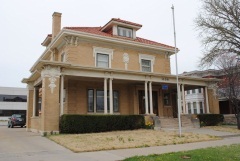 The house is locally significant for its architecture and regionally significant for its association with the notable Kansan, Nelson Antrim Crawford, who resided here from 1938 through his death in 1963. This house is the resource best associated with Nelson Crawford during his lifetime. William and Delora Crosby commissioned Topeka-based architect Frank C. Squires to design this Italian Renaissance-style residence in 1910. Historic architectural features include the blond brick exterior, ionic columns, stone and terra cotta ornamentation, and a red clay-tile roof interrupted by hipped dormers. The property includes an original garage, whose design and materials reflect that of the house. 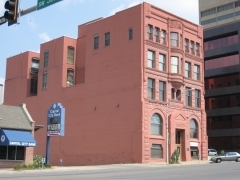 William Crosby was a pioneer Topeka merchant who co-founded Crosby Brothers Department Store, a local institution from 1880 to 1975, which operated out of a building in the 700 block of Kansas Avenue. Crosby lived in this home until his death in 1922, and his wife Delora moved out by 1927. By the 1940s, the home no longer functioned as a single-family residence, but rather served as offices and a reception hall due to its convenient location to the statehouse and business district. Historically, the house was surrounded by other late 19th and early 20th century mansions, including the home of U. S. Vice President Charles Curtis to the north and to the east the home of Hiram P. Dillon, a local attorney, businessman, and philanthropist. Both are extant and listed in the National Register. The Crosby House was nominated for its local significance in the areas of architecture and commerce.